The poster of the exhibition. 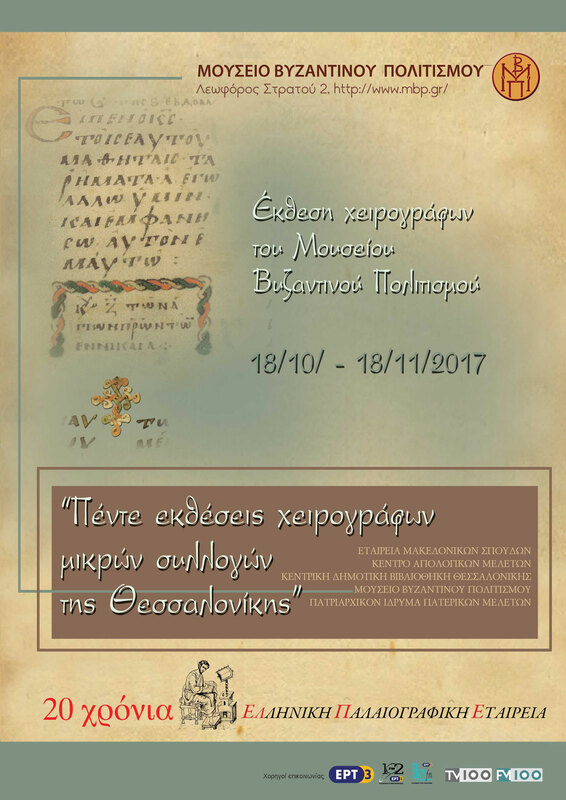 The Museum of Byzantine Culture presents in the reception hall (foyer) an exhibition of manuscripts from its collection, in the context of the exhibition, titled “Five exhibitions of manuscripts from small collections in Thessaloniki”. This small exhibition, which includes manuscripts from the Museum’s storerooms, was organized on the occasion of the celebration of the 20 years since the inauguration of the Greek Palaeography Society in 1997. Ten handwritten codices and fragments, which chronologically cover the period from the Early Christian era until modern times, are shown. Among them the parchment Gospel of the 9th century stands out. It contains the evangelical readings of the year in majuscule script and the music notation. The copy of the manuscript probably took place in South Italy. Α “karamanlidikon” book which contains prophecies, from the late 18th-early 19th century, is also of great interest. It contains the experts from the Old Testament, which are read during various circumstances. The language of the text is Turkish (for the Turkish-speaking Orthodox of Asia Minor), but it was written in the Greek alphabet (=“karamanlidika”), while the intermediate texts, some of them hymns, are written in Greek. The exhibition will be shown until November 18, 2017.